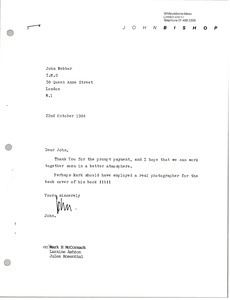 John Bishop thanks John Webber for his prompt payment and indicates his hopes that they can work together soon in a better atmosphere. 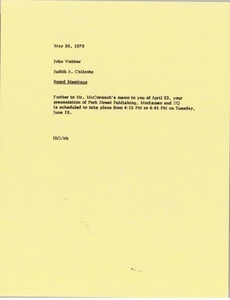 He notes that perhaps McCormack should have employed a real photographer for the back cover of his book. Concerning some ideas related to the manufacturing of musical instruments. 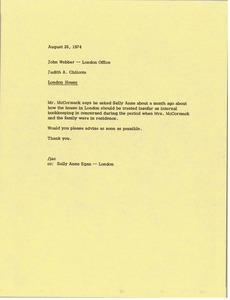 Chilcote asks how the London house should be treated in bookkeeping when Mrs. McCormack and the family were in residence there. 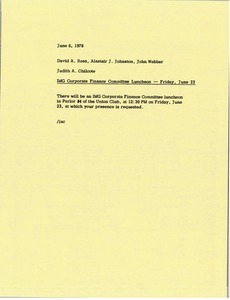 Recipients are asked to attend the IMG Corporate Finance Committee luncheon on Friday, June 23. Recipients are asked to attend a meeting with the Board of Directors and Corporate Advisors to discuss IFM. 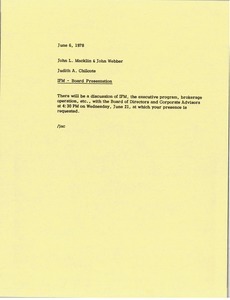 Chilcote informs Webber of when his presentation on Park Street Publishing, Marksmen, and HQ is scheduled to take place. 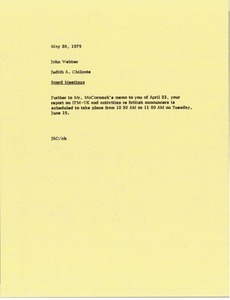 Chilcote informs Johnston and Webber of when their presentation on client accounting and finance is scheduled to take place. 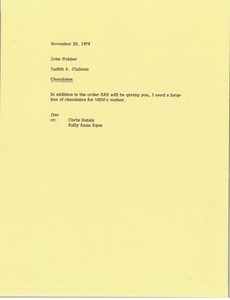 Chilcote requests a large box of chocolates for Mark H. McCormack's(MHM) mother in addition to the order Webber will be receiving from Sally Anne Eagan(SAE). 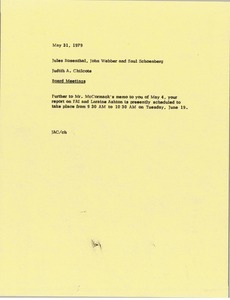 Chilcote informs Rosenthal, Webber, and Schoenberg when their presentation on Fashionart International(FAI) and Laraine Ashton is scheduled to take place. 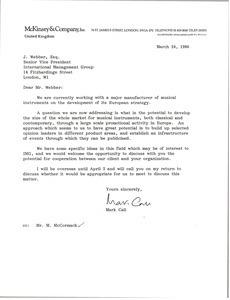 Chilcote informs Webber of when his presentation on International Financial Management - United Kingdom(IFM-UK) and British announcers is scheduled.